Coconut water has been growing in popularity over the past couple of years to the point where I see it just about everywhere. The first offerings were plain coconut water, with advertising that usually promoted how great for hydration the water was. 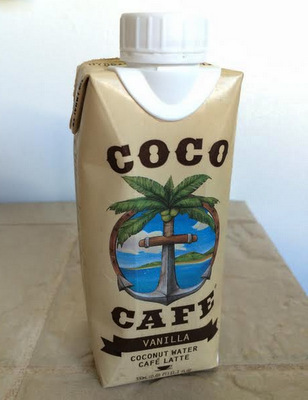 These days, there are many more flavored options of coconut water – including coffee-flavored options, like Coco Cafe. This is a line of coconut water cafe lattes, boxed drinks that are intended to be tasty, give you a little caffeine boost and help hydrate you. I was hesitant about this combination, but I couldn’t resist giving Coco Cafe Vanilla a try to see how it tasted. The drink is definitely refreshing and it captures the flavors of coffee, milk, vanilla and coconut water, more or less in that order. The very first sip will remind you of a canned Starbucks coffee drink, with smooth espresso and dairy flavors, combined with a nice hint of sweetness. The vanilla is a little bit more subtle, though it is present, and there is a lingering hint of coconut water flavor. It’s definitely a unique drink, and I’d have to say that it’s a pretty good one, especially if you’re a fan of coconut water in the first place. I didn’t think that I would enjoy it, but I ended up drinking one quickly and wanting another! It contains as much caffeine as one shot of espresso (120mg), which is enough to perk you up in the morning if you want to sip one of these on your commute or down one after a workout at the gym. I think that a regular iced latte would bet a better choice if you’re looking for a drink to savor and sip slowly, but the Coco Cafe is so refreshing that it is a great option when you are on the to.